Recipe for an instant party: Uncork four bottles of wine, and set out Dorothy's Candies "The Edgewood" Wine Tasting Party Tray. 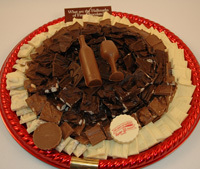 This tray features pure chocolate barks in bite-sized pieces, ready for tasting. Simply offer wines to match the color of chocolate, and work from the outside in. Choose a white wine for the white chocolates, and so on into the center where the deluxe double-dark chocolate bits await. Your guests will have so much fun, you won't even have to clean!